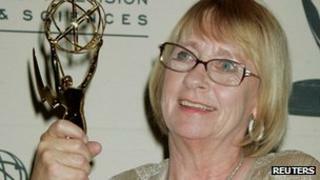 US TV actress Kathryn Joosten, best known for her roles in Desperate Housewives and The West Wing, has died. Joosten, who was 72, died in California of lung cancer, 11 years after she was first diagnosed with the disease. The actress won two Emmy Awards for playing nosey neighbour Karen McCluskey in suburban drama Desperate Housewives. She had previously portrayed Delores Landingham, the secretary to fictional US President Josiah Bartlet, played by Martin Sheen, on The West Wing. Joosten's family said in a statement that the actress was "surrounded by love and humour 'til the end", adding: "We are laughing through our tears." Joosten did not begin her acting career until the age of 42, having worked as a psychiatric nurse at a medium security hospital unit in Chicago. But after getting divorced and hearing her mother's deathbed regrets at not having pursued her dreams, Joosten decided to revisit her childhood passion for acting and became involved with her local community theatre. She then worked as a street performer at Disney World in Florida before moving to Hollywood in the mid-1990s and winning small roles in shows including Murphy Brown, Frasier and The Drew Carey Show. The West Wing brought wider recognition. "Some people in Hollywood think of me as a model for dramatic mid-life transitions - from suburban housewife to Emmy-winning actress," she said. "But I never plotted out a master plan for following my dreams." Her other roles included one of the recurring Gods in Joan of Arcadia and Claire in Dharma and Greg. Her part in Desperate Housewives earned her the Primetime Emmy Awards for outstanding guest actress in a comedy series in 2005 and 2008, and she was nominated again in 2010. She encouraged the show's creator Marc Cherry to give her character lung cancer in order to raise awareness. The show ended in the US just three weeks ago after eight years on air.